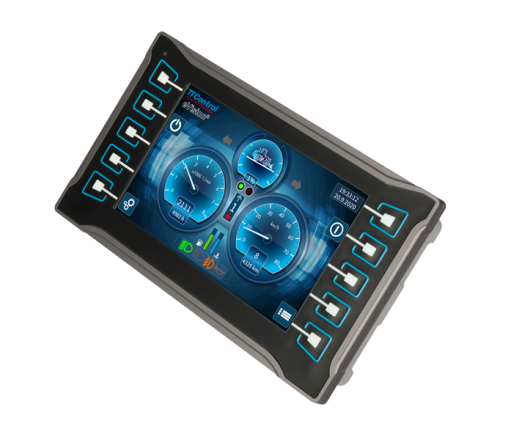 The highly robust eVision² 7.0 comes with an 800×480 pixel 7-inch display and 10 freely programmable keys. You can read in engine and control data, or connect a joystick through two independent CAN channels, and visualize everything in the smartest possible way. These ARM-based terminals are programmed in CODESYS©3 like the larger HY-eVision² 10.4, and provide the same impressive graphics library. You can use transparent dials, tilt images, embed an analog camera signal or move freely in PDF© documents, e.g., a user manual. These fast-booting operator terminals offer much more than most other products on the market today – including a flat, easy-to-clean IP 65 front and a separate USB connection.